Join us for Food Truck Friday Nights at Wooden Valley!!! 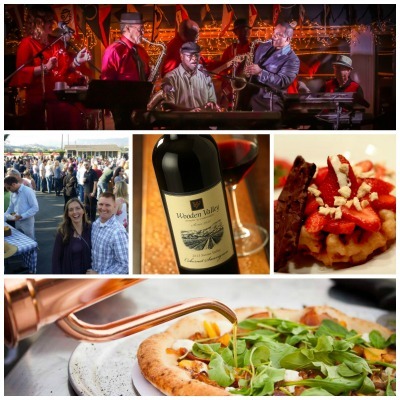 On the fourth Friday of every month Wooden Valley Winery will host an assortment of street food vendors and live music. Grab a bottle (or glass) of wine from the tasting room and order dinner from one of the amazing food vendors. Food Truck Fridays….fourth Friday of every month from May through October…..See you there!!! Vist www.woodenvalley.com or our Facebook page to see who’s going to be there. This year we plan to continue our Food Truck Friday tradition of giving back!!! We’ve teamed up with Ron Park of the band Silverback to support the Wounded Warrior Project. Ron has offered to organize live music and Wooden Valley will host a raffle at each of the 6 Food Truck events. 100% of all proceeds will go directly to the Wounded Warrior Project. We know you have a deep compassion and love for our veterans, and with your donations, we hope to raise $10,000 for “Wounded Warrior Project” this summer. United, we will make this happen, so please join us!! !